French President Emmanuel Macron vowed to rebuild the cathedral described as the soul of the nation and expressed relief that "the worst had been avoided" in a blaze that had at one point threatened the entire edifice. Thousands of Parisians and tourists watched in horror from nearby streets cordoned off by the police as flames engulfed the building and officials tried to save as much as they could of the cathedral's countless treasures, built up over centuries. The inferno destroyed the roof of the 850-year-old UNESCO world heritage landmark, whose spectacular Gothic spire collapsed as orange flames and clouds of grey smoke billowed into the early evening sky. Around 400 firefighters battled into the night to control the flames, declaring in the early hours of Tuesday that it was partially extinguished but completely under control, around nine hours after it broke out. Paris fire brigade chief Jean-Claude Gallet said "we can consider that the main structure of Notre-Dame has been saved and preserved" as well as the two bell towers. But "the whole of the roof has been devastated... a part of the vault has collapsed, the spire is no more", fire brigade spokesman Lieutenant-Colonel Gabriel Plus said. Gasps and cries of "Oh my god" erupted around an hour after the fire first broke out when the top portion of the church's spire came crashing down. "We have been dealt a knockout blow," a stricken-looking Paris Archbishop Michel Aupetit told reporters. The cause of the blaze was not immediately clear, but the cathedral had been undergoing intense restoration work which the fire service said could be linked to the blaze. French prosecutors said it was being currently being treated as an accident. 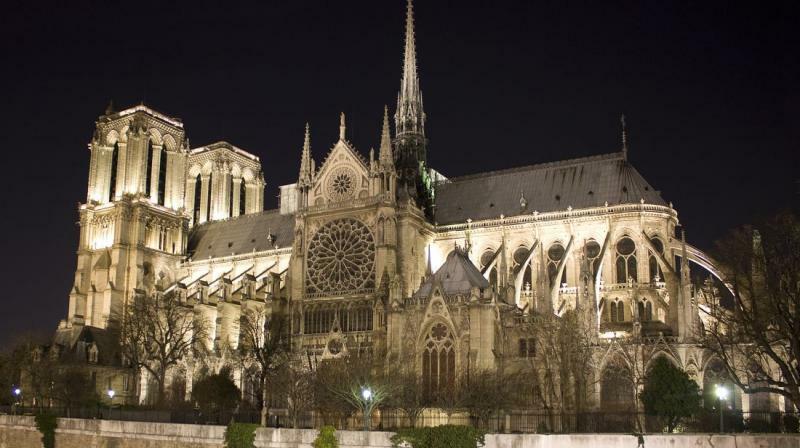 Historians expressed dismay at the collapse of a building that has been a symbol of France for almost a millennium. "If Paris is the Eiffel Tower then France is Notre Dame. It's the entire culture, entire history of France incarnated in this monument," Bernard Lecomte, a writer and specialist in religious history told BFM TV. Deputy Paris mayor Emmanuel Gregoire told the channel that workers were scrambling "to save all the artworks that can be saved." Officials later said teams had managed to salvage an unknown quantity of the cultural treasures. Macron cancelled a planned national policy speech on recent "Yellow Vest" protests and instead headed to the scene, where he vowed the cathedral would be reborn. "We will rebuild Notre-Dame because it is what the French expect," he said, describing Notre Dame as "the epicentre of our life" and the cathedral of "all the French", whether religious or not. France's billionaire Pinault dynasty immediately pledged 100 million euros for the reconstruction effort. German Chancellor Angela Merkel called Notre-Dame cathedral a "symbol of European culture" as the blaze raged. The Vatican on Monday expressed its "incredulity" and "sadness" over the fire. One firefighter was injured in the blaze, the fire brigade said, revising an earlier assessment that the individual was in a serious condition. US President Donald Trump in a tweet said it was "horrible" to watch the fire but caused controversy by offering advice on how to put it out. "Perhaps flying water tankers could be used to put it out. Must act quickly!" he said. নাগৰিকত্ব সংশোধনী বিধেয়কৰ প্রয়োজন আছেনে?